Now, we learned last week about the colour councils and about our 2011 colour fates being destined for Honeysuckle. Don’t like Honeysuckle? 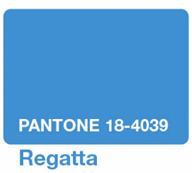 You’re in luck, because there are runner ups: Russet, Blue Caracao, Peapod and Regatta. Most of these will make it your closet in some way this spring, trust me, whether you buy designer, H&M, Zara or wherever else you shop. Because I always post the latest H&M lookbook, I thought I’d do something different this time and show the possible “inspirations” (although some of them were plainly coincidental) from runway to H&M. 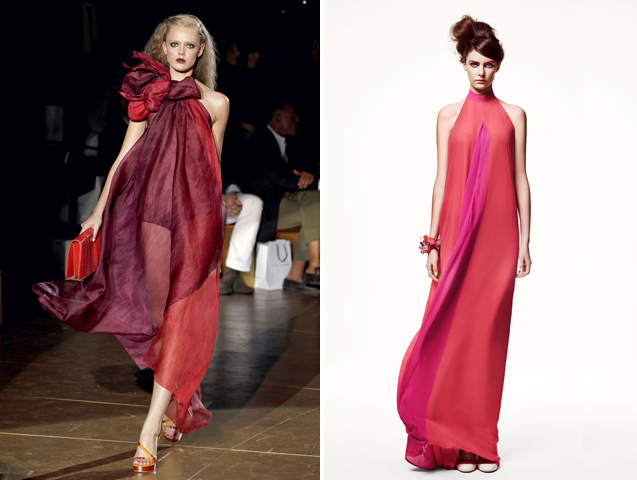 While the silhouettes may differ, the colour stories are similar. None of them are designer knock-offs but mainly something that, perhaps, works on a semiotic level. There’s no argument that Peter Copping of Nina Ricci loves pastels and Honeysuckle in both cases makes pretty and flirty summer ensembles. I know, H&M is no Nina Ricci but it’s pretty adorable too. Marc Jacobs was all about channeling the 70s and YSL with his flow-y numbers and H&M takes the flow-y note with this pretty two-tone maxi. Perhaps the silhouettes and colours aren’t a coincidence here? Russet meets Honeysuckle at Loewe in the form of an amazing leather t-shirt (Loewe is a leather house after all). H&M combines the colours with a pretty two-tone spring turtleneck. Russet (or pretty close to it) is accompanied by simple black and white geometric shapes both at Phillip Lim and H&M. I actually like H&M’s version better. 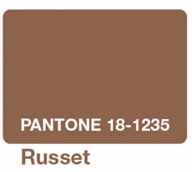 And Russet combined with Regatta begets cute tomboy ensembles. I admit that I’m totally crushing on the Phillip Lim suede blazer. 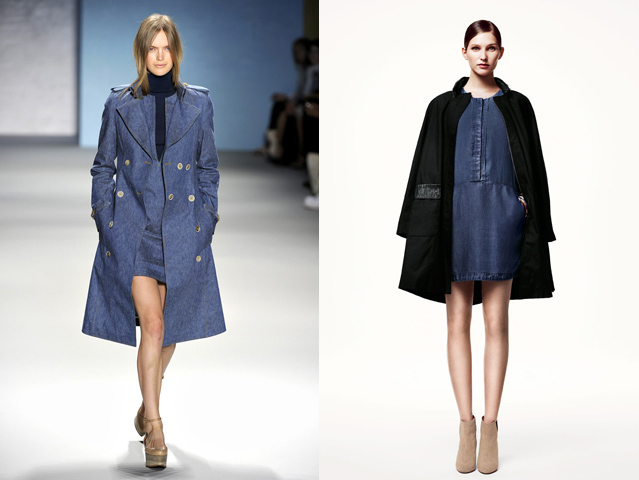 Of course, one cannot do blue or summer without some denim. 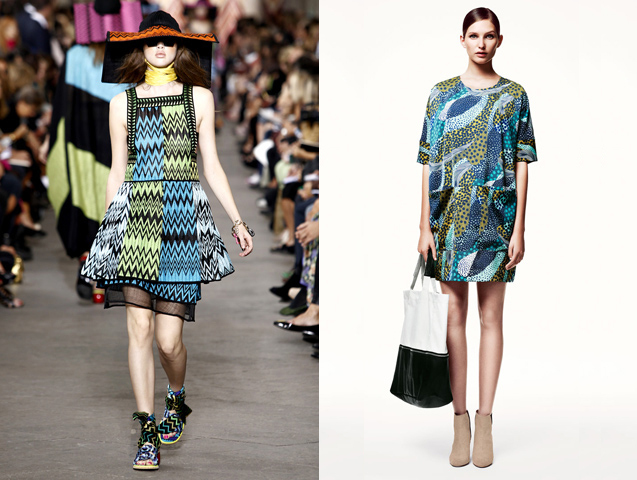 Same shade, different stories here: Derek Lam’s feels very 70s while H&M’s is kind of 60s mod. 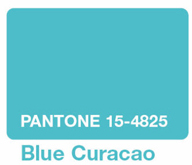 Last year turquoise was the colour of the year, and this year its cousin Blue Curacao is coming up strong. 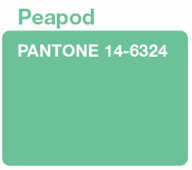 I’m sure to most people it’s still turquoise but designers can get pretty specific about these type of things. I thought Missoni’s show was total weirdness and strangely unsophisticated for the brand, but I enjoyed this particular exaggerated Missoni print with Regatta, Blue Caracao and Peapod (not as popular as others). But, more importantly, I’m in love with H&M’s version of the colour combo. If it’s a silk or a cotton blend, I’m sold. And Blue Caracao and Regatta make an appearance again in this adorable pouffy sleeved Fendi dress and Peapod joins them in the H&M version. 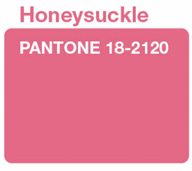 I know from the Honeysuckle post that so many of you were not aware of colour forecasting (neither was I until I started my blog). 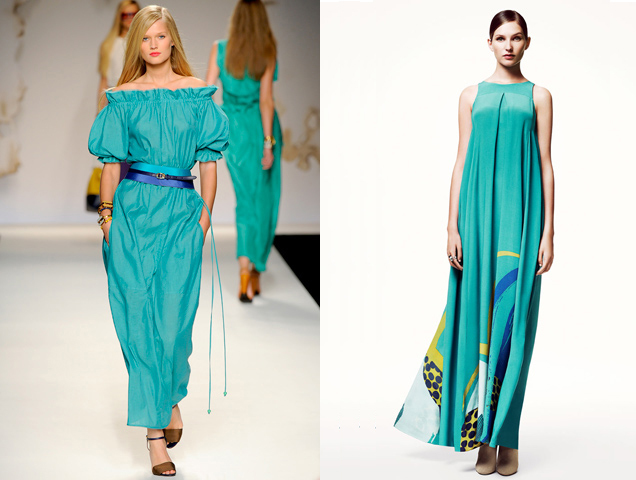 What do you think of the runway to fast fashion interpretations of the colour stories and silhouette themes? And finally, H&M’s S/S ’11 lookbook? I say delightful. * H&M images courtesy of H&M (photography by Hasse Nielsen).